The Colonial Junior Addition dollhouse kit can be built to fit either the right or left side of your dollhouse… the choice is yours. Expand your Vermont Farmhouse Jr. dollhouse today with this addition kit. The Milled Plywood Foxhall 2-story wing addition dollhouse kit is the perfect way to expand your Foxhall Manor dollhouse and it features a roof-top patio! The Foxhall 2-story wing addition can be built to fit either the left or right side of your dollhouse. The kit includes the columns and decorative rails to match your Foxhall Manor. 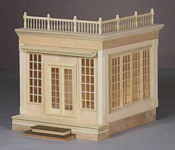 The Foxhall Conservatory is an elegant addition and can be built to fit either the right or left side of your dollhouse. It includes an extra high 11 1/4 inch ceiling and 18-light windows. This conservatory also works very well with many of our New Concept Collection dollhouse kits. The Junior Conservatory Addition dollhouse kit works with the 3-story Junior Series dollhouses and the 3-story Lilliput® dollhouses. This cute addition makes a very nice breakfast nook, music room or anything your imagination can visualize. 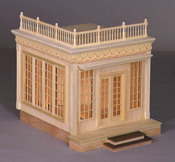 The Montclair Conservatory is an elegant addition made especially for the Montclair Dollhouse. It includes an extra high 11 1/4 inch ceiling and 18-light windows! This conservatory also works well with many of our New Concept Collection dollhouse kits. A wall liner is included, so you can attach the Conservatory to a dollhouse with a finished exterior, to create a smooth interior wall. Works with any dollhouse that has a 1 3/4 inch high foundation! 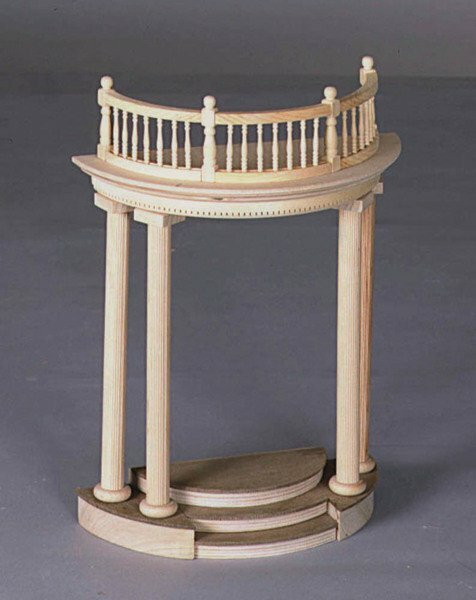 Create the ulitimate entrance with a beautiful circular porch designed just for the Montclair Dollhouse. 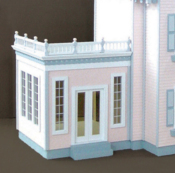 This elegant porch will also work with many of our other dollhouse kits, all that is required is a 1 3/4 inch high foundation. The Montclair below is shown pictured with the 602 Montclair Porch, 603M Montclair Conservatory and 604 Montclair 2-Story Wing Addition. Each unit is sold separately. 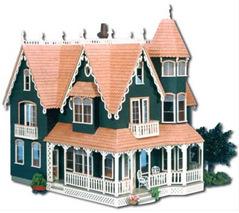 The Newport 2-Story Addition kit allows you to expand your Newport dollhouse kit. This kit is produced to go on the left side of your dollhouse when looking from the front. Take your beautiful Victorian home to the next level with this extension…you’ll enjoy the extra space for decorating! You could make it for the right side of your dollhouse but would need to purchase stock length nosing, as this is precut to work on a left side addition only. If you would like to purchase stock length nosing, please call us direct to order. The 2-Story Jr. Addition dollhouse kit allows you to expand your Alison Jr. dollhouse with ease. With two additional rooms and a rooftop balcony, just imagine what you can do! This addition kit can be built to fit either the right or left side of your dollhouse.